The Ohio Street bridge crossing Interstate 95, which was built in 1960, can be seen Wednesday in Bangor. It now carries nearly 10,000 vehicles per day and is listed by TRIP as one of Maine's structurally deficient bridges. The bridge is funded for improvements, and the deck of the bridge is funded for replacement, both in 2017. 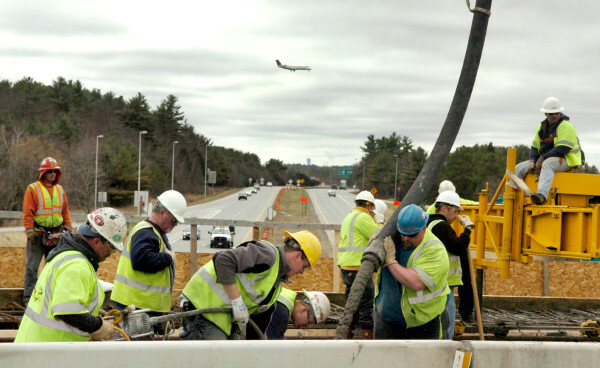 Workers with T. Buck Construction in Auburn pour concrete while working on the Hammond Street bridge over Interstate 95 in Bangor, April 1, 2010. PORTLAND, Maine — A survey by a national transportation group found that 15 percent of Maine bridges have some structural deficiency, with the same percentage of deficient bridges in the Bangor area. The group TRIP released the report based on Maine Department of Transportation data Wednesday to amplify a plea for increased funding for bridge maintenance in the state, in advance of a statewide bond question that will go to voters Nov. 3. “A significant portion of that is for highways and bridges, and we see a need to increase bridge funding,” said Ted Talbot, spokesman for the Maine Department of Transportation. The bond question asks voters if the state should borrow $68 million for bridge projects and $17 million for other transportation infrastructure, including ports, harbors, aviation, transit and rail. 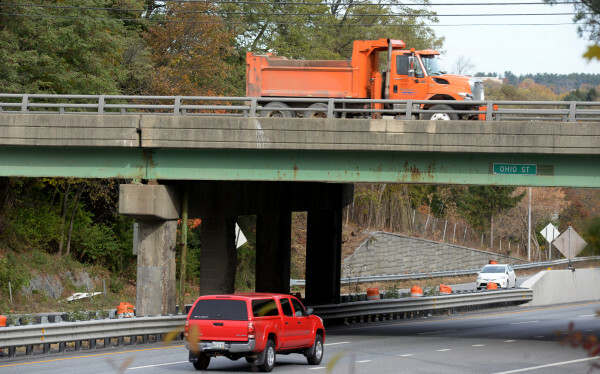 Talbot said the state’s bridges are inspected regularly and are safe, but that the department hopes to nearly double its annual funding for bridge rehabilitation, repair and replacement work to keep up with maintenance of an aging infrastructure. Maria Fuentes, the executive director of the Maine Better Transportation Association, said if voters don’t approve new borrowing in the bond question on the ballot on Nov. 3, the Department of Transportation would face a $40 million shortfall for its three-year work plan, out to 2017. Fuentes said she expects the department will seek another transportation bond in the next legislative session as well. Transportation officials and Gov. Paul LePage initially sought a larger bond package for infrastructure projects. A 2014 Maine Department of Transportation report estimated the number of bridges in poor condition would triple by 2021. Nationally, the report stated, the number of structurally deficient bridges declined to 10 percent in 2014, down from 12 percent in 2007. State-maintained bridges in poor condition increased to 11 percent from 9 percent during the same time period. Maine transportation officials estimated in the 2014 report that the average annual state funding for bridges would need to increase by about $38 million each year to keep bridges from further deteriorating. The current average annual funding would need to increase by about $114 million, to $217 million a year to bring the state’s bridges in line with service, condition and safety goals. The TRIP report also states that economic gains are at stake in the quality of the state’s roads, as some businesses have shifted away from warehousing and storing raw materials in favor of getting more timely and targeted shipments. The report states investments in roads also can reduce vehicle maintenance costs for businesses and mean savings in terms of reduced delays, safer travel and lower fuel consumption. The TRIP report found 364 of the state’s bridges had structural deficiencies and another 432 were functionally obsolete, meaning they don’t meet modern design standards, out of a total 2,419 bridges over 20 feet long that were surveyed. In that reporting, TRIP did not account for the bridges already in line for Department of Transportation improvements in the department’s three-year work plan. Of the 364 bridges with structural deficiencies, the report found 205 of those bridges supported average daily traffic of 500 or more vehicles. Search for any of the 205 structurally deficient bridges with more than 500 average daily vehicles in the map below. “Maine’s bridge conditions are only going to get worse if greater funding is not made available,” Will Wilkins, TRIP’s executive director, said in a news release. On its website, TRIP states it is supported by insurance companies, equipment manufacturers, distributors and suppliers, highway and transit construction companies, labor unions and other organizations. In the Bangor area, the report highlighted the most highly trafficked bridges with deficiencies, including the Ohio Street bridge over Interstate 95, which is funded for replacement in 2017; the bridge on Stillwater Avenue in Old Town, which is a candidate for replacement in 2018; Route 7 over I-95 in Plymouth, which is a candidate for having its deck replaced in 2018; and Pleasant Street over the Pleasant River in Milo, which is a candidate for replacement in 2017. According to a Bangor Daily News analysis of the individual bridge data, Portland and Bangor had the most average daily traffic over bridges with deficiencies. Rumford and Falmouth had the highest number of deficient bridges. The report listed deficient bridges using the Maine Department of Transportation scores ranking the bridge’s deck, substructure and superstructure. The substructure includes the vertical portions of a bridge from the ground up to the horizontal superstructure. The superstructure supports the deck, where the rubber meets the road.